The Ballymena United goal comes under pressure during today's Danske Bank Premiership game against Glenavon at the Showgrounds. Picture: Press Eye. Ballymena United suffered back-to-back defeats in the new year after losing to Glenavon at the Showgrounds. 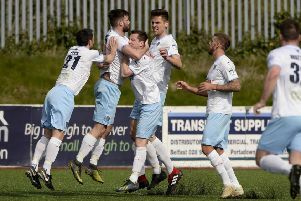 The Danske Bank Premiership’s leakiest defence was breached on four more occasions as United’s defensive frailties were exposed once again. Gary McCutcheon was named in the starting line-up after his transfer from Crusaders - one of four changes made by Glenn Ferguson in response to the New Year’s Day defeat at Warrenpoint. And McCutcheon almost marked his return to United colours with a goal inside the opening 90 seconds as he collected a square pass from Johnny Taylor and rolled defender Conor Dillon before firing a left-footed shot straight at James McGrath. The visitors replied as Declan O’Brien won a header, knocking the ball down for strike partner Eoin Bradley, whose effort was blocked by keeper Stuart Addis with the ball rebounding off Johnny Taylor and trundling towards goal before the defender got back to clear off the line. From the resultant corner, O’Brien forced a close-range save from Addis. The visitors were awarded a penalty on eight minutes after Johnny Taylor clipped O’Brien just inside the penalty area. Bradley quickly grabbed the ball but could only drag a feebly struck spot kick past the left hand post. Glenavon had another chance on 13 minutes when United left-back Stephen McBride, in trying to intercept a Shane McCabe through ball, toe-poked the ball at full stretch past Addis but looked on in relief as the ball drifted wide of the post. Given their early dominance, it was no real surprise that Glenavon went in front on 17 minutes. Bradley went some way towards atoning for his earlier mistake when his quick footwork in the centre of the pitch left Johnny Taylor on his backside and Bradley then slipped a pass through for Ciaran Martyn to fire first time past Addis. It was almost 2-0 on 22 minutes when Marshall beat Addis to a Kyle Neill corner but the full-back’s header clipped the top of the bar on its way over. Glenavon came close to extending their lead on 28 minutes when O’Brien latched onto a Neill pass and went round Addis, but with the angle narrowing all the time, he could only hit the stanchion with his shot. O’Brien glanced header wide while unmarked before United almost equalised on 42 minutes. McCutcheon crossed the ball into the path of Tipton and the in-form striker’s low shot beat keeper McGrath but not alert defender Dillon on the goal-line. Ballymena were level two minutes after the restart. Davy Munster played in Gary Thompson down the right hand channel and his low cross was bundled home from close range by Darren Boyce. But just as United looked to getting on top, they were rocked by a second Glenavon goal on 63 minutes. It came from a soft free kick, awarded by referee Stephen Wallace after a collision between Shane McCabe and Allan Jenkins. Kyle Neill swung over the kick which wasn’t cleared on a couple of occasions and as the ball dropped, Martyn headed the ball towards goal and O’Brien swivelled to volley past Addis. United almost came up with an immediate equaliser when Jenkins cut the ball back for McCutcheon but the striker delayed his shot and Rhys Marshall flung himself at the ball to block the effort. Ballymena came close to levelling on 76 minutes when Jenkins burst onto Tipton’s clever ball around the corner. He went round McGrath but from a narrow angle, Jenkins’ shot was cleared off the line by Marshall. Glenavon scored a third with 10 minutes to go when Conor Dillon’s long ball forward saw O’Brien break the the offside trap before tapping the ball past Addis and guiding it into the unguarded net. McCutcheon gave Ballymena some late home as he fired a half-volley over McGrath after William Murphy’s mis-timed header fell into his path. But hopes of a dramatic equaliser were short-lived as a minute later, after Addis had blocked Mark Patton’s initial effort, the winger lofted the ball back over the keeper and O’Brien nipped in with a final touch at the back post to complete his hat-trick. Ballymena United: Addis, Kane, Taylor, Munster, McBride (sub Teggart 82), Thompson, McCaul, Jenkins, Boyce, Tipton, McCutcheon. Subs (not used): Surgenor, McCullagh, Shevlin, Gawley. Glenavon: McGrath, Marshall, Murphy, Dillon, Singleton (sub Patton 83), Caldwell, McCabe, Martyn, Neill, Bradley (sub Hamilton 79), O’Brien. Subs (not used): Lindsay, Kilmartin, Sykes.